Sam has scored a van and friends (the VANSACS) to maraud the Continent. Round 3 was at Montagnes du Caroux in France. 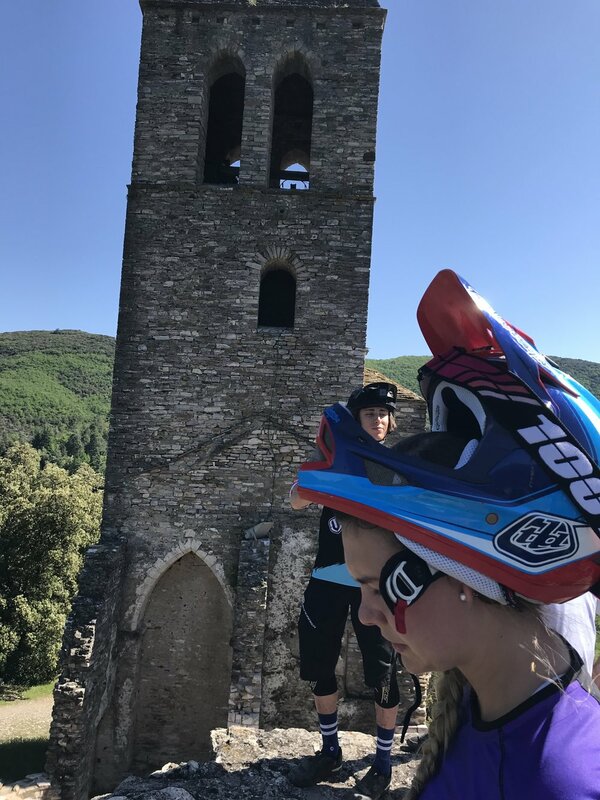 A quintessentially beautiful french village in the Massif Central with an abundance of long rocky descents, and (on day two) wet ’n’ slippery trails. Thanks Sven as always for the bangers. Picked up Dan Self from the airport with Bubbleys (Brendon Clarke) had a small look around Toulouse, got a message from my Cousin Amy Shaw after she saw I had tagged my location.. Whoops forgot she lived there! Headed back to Orlargue for a wee ride and chill and snickers. Weather is lit. Up and into it. France changed up the format a little this time and we were getting out on stages 5 to 8 today instead of the usual stages 1 to 4. Bubbles drove his car and I drove Morty (the van) to the top of stage 5 with our crew for the day (Dan Self and Shane Leslie). Stage 5 was fast with a good mix of rock, dirt, and roots on reasonably smooth trail with a flat pedal towards the end. We pedalled back up to stage 6 and then into it. 6 had a lot of solid pack dirt corners between tight trees, making for another fast stage. Baguette and snickers for lunch. Towed a whole crew up this time with Brooke Thompson (Miri), Nate Corrigan (Bifi), and Megan Rose (will get in trouble for nickname here) added to the group. We managed to fit 7 people and 7 bikes into Morty for the last round of shuttles. Leaving the door open for a bit of ventilation in the back, we nearly took out multiple cars on the way up to stages 7 and 8 on wee tight Frenchy roads. 7 was steep, rocky and rooty. Not really any dirt in this one, and the hardest stage of the race (although 8 comes pretty close). Climbed back up to 8 on le bike to find a lot more dirt and the odd technical rock feature towards the bottom - finishing on big slabs of slippery wet rock taking you all the way into a small stream at the end. Snickers to finish the day. Looking at Snickers for breakfast, nahh body’s a temple. Muesli and coffee (sessions at Ground Effect got me hooked). Packed into Morty and headed up to stage 1. Another narrow Frenchy road got us to the top (patience). We mucked up the vehicle shuttle idea on this one a little so Bubbles opted to miss prachy on 1 and drive Morty down for us (thanks Bubbles). 1 was pretty straight with flow, two tight Frenchy corners, one speed section and a couple of wet rocky chutes towards the end. We all gathered at the bottom and biked up to stage 2, everyone’s favourite trail. It consisted of mainly loamy dirt and rock sections that could be jumped or flowed. A good mix of play and speed, getting steep at the bottom right after a climb. Lunch stop at LIDL, which won't allow shirtless entry fyi. Chaussen aux Pommes, bananas, and baguettes (and snickers) for lunch followed by a big ol’ pedal up to 3. This was the rockiest stage of the weekend and seemed to just follow an old Frenchy horse and cart path, full of big rocks for a good 7mins of racing and then into some climbs and dirt towards the end. 4 was a short stage from the Orlargues church (race village) back down to the pits, a 1min urban stage with a couple of narrow building sections. Best weather we have had since arriving. Back home to get everything cleaned and ready for race day tomorrow (snickers). Overcast for the day (classic EWS). Had the same start as Shane (Big Lez, guy from Chile that I met breaking into his house). We headed to the start and I got some last minute maintenance done thanks to SRAM for the brake calliper parts. We got a shuttle to the bottom of stage 1 and pedalled to the top with Alexander Kangas (dude from Sweden who loooves the nicotine). Had a good start to the day feeling comfy, but not pushing hard enough. Losing only a small amount of time and still in the mix. Stage 2 was the same story as 1, feeling really comfy and not getting loose at all. Getting a reasonable time, but not quite where I want to be. On stage 3 I finally found some speed and went for it, unlucky to crash in a tight Frenchy corner losing the time I had made. Still my best stage of the day. By stage 4 it had started raining (ayyye). Took the inside line Loui Harvey was too scared to do and got down for a reasonable day in 51st, less than 10secs off the top 40 and 20 seconds to the top 30. Times are tight like a tiger. Amped for tomorrow (and some snickers). Pizza for dinner with the team, Bubbles shouted. Sticker set turned up from Has Designs to add a Frenchy touch to the Zerode, pretty much a child about this kinda stuff, froth. Rained all night, looked out the window, still raining. Mildly worried about riding stage 7 in the wet. Headed to the start and it was feeling winterish with a bit of rain and sub 10 degrees temp, along with fresh snow on the surrounding hills. We pedalled up to stage 5 with a tiny shuttle-assist and then into it. Was supposed to be an easy one, but water on the rock made it pretty challenging, I started the day off being taken for a ride instead of riding my bike. 6 was much the same as 5. Back to base for some snickers and back up the hill for 7. Really taken for a ride on this stage, full of steep rock and rooty sections. Control was minimal and I just went with it managing to not hit the ground, but did hit a camera man (sorry old mate), stoked to get down there without damaging anything. Big ol’ pedal up to 8, I was getting tired by now and me arms were worn out after battling the slip slip all day. Got down 8 with dead arms. Stoked with the weekend’s riding, still figuring out how to go faster as I moved back to 59th in the overall. Think the snickers are gunna have to go. Completely rekt potato for the day. Dropped Big Lez at the airport in Toulouse and visited Amy (cousin) and Tebo (her boyf) along with Leo and Flo (the kiddies). After a mean platter of French snackies at Amys, Brooke and I took off for Sospel.